The iconic truck scene from Terminator 2, where Arnold is on the bike trying to fight off the T-1000 down in the flood drains. This was one of the coolest movie scenes of the entire franchise if not one of the coolest of all time! 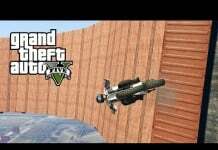 Like a lot of famous movie scenes, this bike scene has been recreated in Rockstars Grand Theft Auto 5.